Edward Curtis and Edward Mitchell were Boston printers, onetime type-founders, and suppliers of printers’ goods. From 1875 they introduced a range of presses, mostly aimed at the amateur market, and continued production through the 1880s. 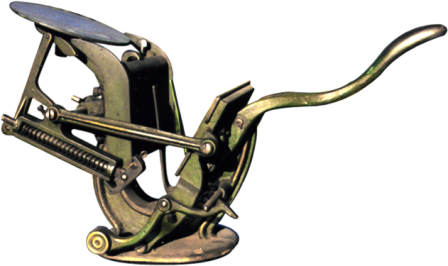 The Caxton, a two-roller, self-inking lever press made by Curtis and Mitchell around 1876, differs from most presses of its type in its distinctive weight-operated gripper mechanism. Most grippers are spring-operated. The press pictured still has most of its original, soft green paint.